You May Also check: Where To Download The Latest Ntel VOLTE App For Making Of Calls And Sending SMS Over LTE. The process of opening an account with zenith bank directly from your mobile phone, is as simple as ABC, as only what you need do is just to pick up your mobile phone and dial a simple short code which is already provided below, and guess what? Your zenith bank account number containing a successful message will be sent to your phone number in a few seconds. >>First, Dial this USSD Code *966*0# on your phone. >>Next, enter your First name as required by zenith using your phone's keypad and then Tap/click Send Button. >>You should also Repeat Step 2 above so as to type your Last name as requested by them. That's it, Congrats! because you are now banking with zenith bank, now you will receive message saying, your account was successfully created and here is your bank account number. 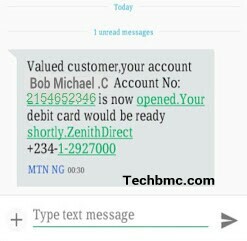 Also Check: How To Buy Airtime/credit From Zenith Bank with Just a dail Of short Ussd Code On Your Mobile Phone. Indeed you have opened a bank account with Zenith bank, and the next thing that should come to your mind is how to credit and debit from the account. Although, that one is not a big deal, normally, crediting (depositing) or withdrawing money from the account, has to do with you going to the bank. But before you start your transaction, you are required to first visit any near by zenith bank branch with your passport photograph and your BVN in order to complete your registration. Check How To Activate Your Verve Card For Any Online Payment And Business Transactions In Nigeria.